Photo submitted by Steve Katz. SYLACAUGA, Ala. – A large fox was reported roaming the streets of downtown Sylacauga just after noon on Monday. “I couldn’t believe what I was seeing,” said Mark Lyons, who was eating lunch nearby. 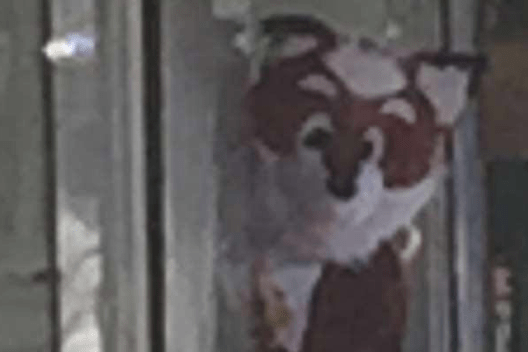 “I rubbed my eyes to make sure I wasn’t going crazy, but it was definitely a fox.” Steve Katz, visiting from Huntsville, also reported a red fox strutting past businesses and restaurants. The Sylacauga Police Department told SylacaugaNews.com of multiple calls reporting fox sightings in the area and said it is investigating. Foxes are mostly nocturnal animals, especially when hunting, but it is not uncommon to see them out during daylight hours. The Georgia Department of Natural Resources (GDNR) says a fox seen during the day is usually searching for food or its home has been disturbed. Although foxes are most commonly found in forests, it is increasingly common to see them in urban and suburban areas, which provide an abundance of food and shelter options for the animals, and fine local restaurant menus may explain why the fox ventured into the city. GDNR advises that foxes should be avoided and not approached or fed. Their website also recommends removing anything, such as bird feeders, that may attract any type of rodent or bird to avoid drawing a fox’s interest.